We are suppliers of silicone lubricants. lubesETC offers lubricants and other chemicals in pack sizes to suit industrial marine and other mechanical maintenance tasks. We specialise in silicone grease and fluid; mostly in our branding but with scope for own- or non- branded products subject to minimum volumes. Delivery can be arranged worldwide, please contact us to check availability and delivery. or by 30 day account, subject to satisfactory credit status. If you know the specific product (e.g. Treadmill Silicone Lubricant) click on silicone lubricants below then > silicone fluids > treadmill silicone lubricant then look for pack size (e.g. 225ml etc...). 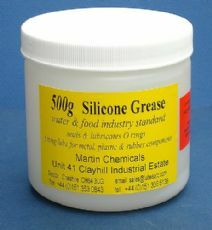 If you know the product type but need to check suitability (eg you need a viscous product for pump packing) click on silicone lubricants below then > silicone greases then check through the three types available and find silicone grease E&V then look for pack size to suit - most sizes have volume options in drop-down boxes. or for Amazon by googling: lubesetc silicone grease at amazon (the net address is too long to quote here). We pack and sell polydimethyl siloxane - silicone - for use as lubricant - either in silicone fluid / oil form or as silicone grease, thickened with silica clay. Uses of the grease include include plastic pipe fittings, 'o' rings and washers, valves, vacuum applications and sites requiring electrical insulation; specific viscosities suit gun oil, fishing reel oil, and treadmill belt lubricant. 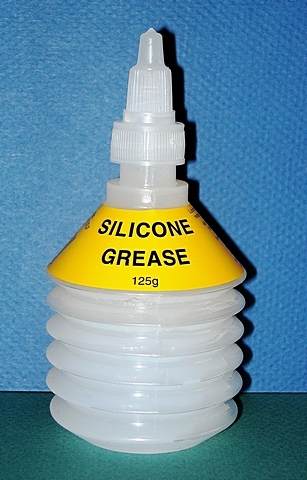 SIlicone is often used as a fitting lubricant. We also sell copper anti-seize paste in sachets for maintenance kits.